Having faith in anything means believing in something without having proof that you should. This is a truly challenging task, but for some it is nearly impossible. Having faith whether it be towards a higher power or in people, can be more difficult for certain personality types. 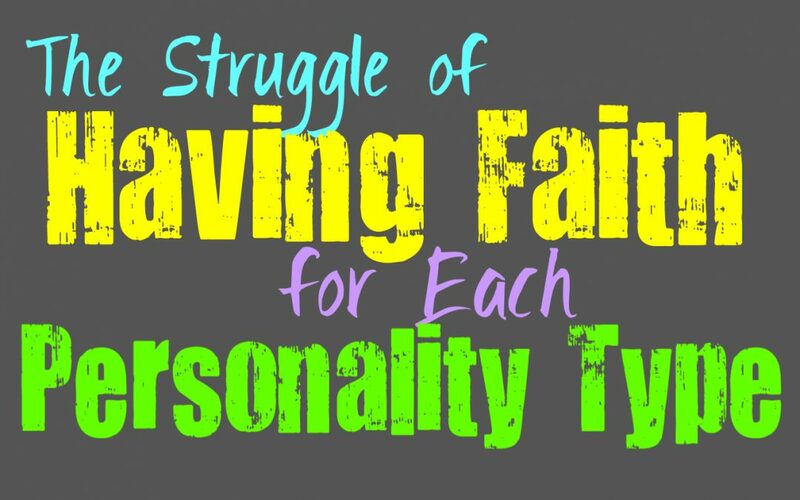 Here is how your personality type handles having faith. INFJs are complex people, who can find themselves searching for faith in others, but at the same time being skeptical. The way INFJs respond to things can definitely be a bit confusing at times, since they feel opposing emotions at times. While there is a largely cynical part of the INFJ, which causes them to struggle with faith, there is big part of them that wants to believe in things they cannot prove. Part of them is connected to this with their intuition, since they might have a strong awareness of something without evidence that others can directly see. ENFJs can sometimes be conflicted when it comes to having faith in something they cannot prove. While they do often strive for this, it can be a challenging process for them. ENFJs have strong intuitive abilities, which does cause them to believe in things without a details line of proof to show others. This can help them have faith in things they cannot see, even though it can be difficult at times. For ENFJs it is important to rely on their sense of intuition, especially when it comes to people. They do their best to follow what they believe is right, even when their faith can feel a bit shaky sometimes. INFPs are often capable of having faith, whether that be in a higher power or in people. While there are times when this faith can be shaken and they might need to reexamine it, that doesn’t mean they do not still have it inside of them. INFPs follow their gut, and do what feels right for them regardless of the evidence around them. They don’t always need solid proof to believe in something, and so they often realize that sometimes there are things in the world that are true even if they aren’t proven just yet. ENFPs often go back and forth when it comes to their faith and beliefs. They are capable of understanding that there is more to life than what can be proven, but that doesn’t mean they don’t struggle at times. They try to trust their gut and go with the things that feel right for them, regardless of what others try to discredit. ENFPs often go back and forth when it comes to the strength of their faith, but ultimately they believe that there is more than what has been proven, and are willing to consider many different possibilities. Faith is often rather difficult for the INTJ, since they rely on facts and proof before believing in something. They realize that there are things out there that have not yet been discovered, but they don’t want to rely on faith to believe in them. They would much rather reserve their judgement until they have facts and proof about something. For the INTJ faith is one of the biggest challenges in life, and something they don’t like relying on to make decisions about what they believe in. ENTJs definitely have a hard time when it comes to their faith, and prefer to rely on facts and proof. They don’t just believe in things because it feels right, mostly because they don’t rely on their emotions. For the ENTJ things need to be proven before they will rely on them or believe in them. ENTJs definitely struggle to have faith and would much rather have some sort of evidence in order to trust in something or someone. They want to see the facts and have a clear idea of what they are getting themselves into, and so faith is not something that comes naturally for the ENTJ. INTPs can certainly struggle when it comes to faith, since they want to have proof before believing in something. While INTPs are aware that there are many things out there that are yet to proven, that doesn’t mean they will simply trust it. They often want to seek out those things and find a way to prove it before completely believing in it. INTPs might have intuitive beliefs or thoughts about undiscovered things, but they will spend time analyzing and learning in order to prove them true or false. For them it is definitely difficult to get in touch with their faith, even though they might be searching for it in some ways. Faith is not something that comes easily for the ENTP, since they value having proof. They can struggle to find a sense of faith in people or things, and especially in the idea of a higher power. While there might be a part of the ENTP that desire the ability to believe in things without evidence, it just isn’t something that comes naturally for them. ENTPs want to search out information and seek ways to discover things that can be proven. While their intuition can give them ideas of what something might be, they still want to find the facts behind it. For the ISTJ having faith often depends on their upbringing and what they have been taught to rely on. Having faith in a higher power is easier for them if it is something they learned from a young age and have become comfortable with. ISTJs are focused more on what they can prove, and so having faith can be a bit of a challenge for them. They want to see evidence before they believe in something, and rely mostly on proven methods. ESTJs can struggle when it comes to having faith, since they search out things that can be proven. They believe in basing things on facts, and so simply having faith in something or someone can be truly difficult for them. ESTJs might find it easier to have faith in people or even a higher power, if they developed that faith from a very young age. They are more at ease with what they know, and if this is something they learned from a very young age, it can become a bit easier for them to believe in it. ISFJs are often more capable of having faith than a lot of other personality types. They are often capable of believing in things they cannot see or prove, since they know there is more to life than that. ISFJs don’t constantly need evidence before believing in something, especially if they learned about it from a young age. If they have become comfortable with the idea of something it becomes more natural for the ISFJ. This is why they find themselves more connected to their families as well, since they have developed that faith in them. ESFJs often find having faith to be easier and more natural than a lot of other personality types. For the ESFJ things are easier to believe in if they grew up learning about it and reaching that level of understanding. They often realize and accept that there are things in the world that cannot be proven with facts, and so they can often have faith from this belief. ESFJs can also have faith in their loved ones, even when that person is making mistakes and not quite proving themselves just yet. Having faith is often truly challenging for the ISTP, since they rely more on facts. It can be a bit difficult for them to believe in the things they cannot see, especially since they are so connected to the physical world around them. Before the ISTP can believe in something, they want to see evidence that is concrete and somewhat obvious. This desire to have things proven can make it truly challenging for the ISTP to have faith in anything they cannot see. ESTPs do find it difficult to have faith, since they are so connected to facts and the physical world around them. They find themselves wanting to have things proven before they can actually believe in their sincerity. ESTPs strive to learn as much as they can so that they don’t walk into anything with false information. They definitely don’t find it easy to believe in the things they cannot see, and sometimes this lack of faith can be upsetting for them. ISFPs can find it difficult to have faith in things, but at the same time they understand that the world is made up of more than what they can see. ISFPs follow their inner emotions, and allow this to be their guide in life. There are times when they believe in things they cannot see, even though they are connected to the physical world around them. ISFPs often search for faith, and want to be able to believe in something greater than themselves. Faith is a complex thing for ESFPs, since it is often something they search for and desire. They want to be capable of believing in things they cannot prove or see, but at the same time they are drawn to the physical world around them. There is a part of the ESFP that desires evidence, and something more tangible than just an inner belief. This part often works against their inner emotions and morals, which often keep them believing in things they cannot see.